Living Well with MS. Fat Free. Gluten Free. Soy Free. This is one of those times. So I’ll tell you the story from my point of view, and also offer you a soy free option if you are so inclined. As it turned out, in the 24 hours I celebrated my 60th birthday by eating out twice, both the Proper Plate and the Harvest Bowl I ordered had baked tempeh sticks as components. And as is always the case when I go to a public place, Romeo was at my side. He is a pro at waiting patiently while we humans sit and eat. As he’s gotten older, though, I make sure to bring him something soft to nap on, since the cement floors of trendy eateries can be very hard and cold for a streamlined aging body type like his. When we’re at home, like any good friend, he often waits to eat his own food until I’m eating mine. I’m so used to this, that even though it’s the last thing I should be doing in terms of being professional, I couldn’t help but slip him a few black beans and bites of tempeh as part of my birthday celebration. I kind of did it without thinking, like you’d share tastes of what you ordered with a friend. I don’t usually cook tempeh at home, but Mike and Kelly make it a lot, and I’ve come to look forward to eating it at their house. Since I’ve moved to Portland, I’ve also discovered I can buy some that is locally made at the Alberta Cooperative Grocery near where I live. Since I enjoyed it so much over my birthday, this week I decided to try some of this local tempeh out at home. I threw together this mustardy marinade, and cut up the sticks to coat them in it while we went for a walk before dark. Romeo is not a voracious eater, and he rarely actively lobbies me for whatever it is I’m cooking. That was mostly the former” job” of our golden retriever Tinne. She loved winter squash, and would lay herself down next to the back door near the stove and literally wait for it to come out of the oven. She’d eat the skins and anything else I’d give her. (She also used to steal pears off my pear tree.) I still sometimes think of her fondly and her digestive system that was akin to a garbage disposal when I’m scooping cooked squash out of it skin. Romeo, on the other hand, is largely indifferent to squash. He prefers sweet potatoes, but even those he rarely lines up for. 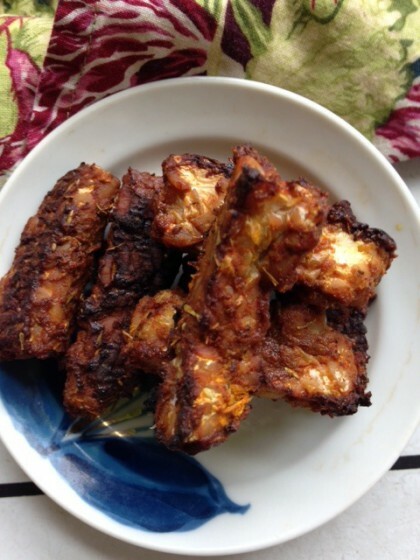 But this week after those clandestine bits of birthday tempeh, I discovered what he WILL line up for in the kitchen–the smell of marinaded tempeh baking in the oven. As I’ve written about before, though I don’t often post recipes using soy, as I get older, the extra calories, protein and plant estrogens in edamame, tofu, and tempeh seem to be very good for me. One of the reasons I rarely buy tempeh, though, is that I don’t always want to eat it all myself. But now I know I won’t be eating it all by myself anyway, even if I’m the only human in the house. In fact keeping it around for more than a day or two might end up being the new problem. Whether or not you are a crazy dog lady like me, sneaking food to your service dog in the restaurant when you know better, I’m sure you will enjoy this savory slightly spicy sweet low fat oil free marinade. If you’d rather use tofu, or even cauliflower steaks, I think you could spread slabs of those with this marinade and bake it too. I’m not sure the soy free tofu recipe I’ve posted would hold up to this kind of baking, but you could give it a try if you’re game. Simply mix all the marinade ingredient together with a fork in a small bowl. Cut up the tempeh into sticks (or cauliflower into “steaks”), put in a salad bowl with the marinade and gently work to coat all with the marinade by tossing it carefully with a small spatula. You can do this ahead of time if you want and just let it sit in the frig like this for an hour or more. Preheat the oven to 375. Line a cookie sheet with parchment paper. Place the sticks (or steaks) on the cookie sheet and bake in the oven for about 25 minutes. Eat on top of greens, grains, or in tacos or as part of a scramble. Yummy, those look great. As soon as I finish my Mary’s Mini I am going to make them!! Thank you!! I will most certainly be trying this! As a nurse and breast cancer survivor I have done extensive research on “soy” and have even given lectures on it. It’s a complex subject that doesn’t lend itself to “all or nothing” choices. There’s whole soy, processed soy, soy protein and fermented soy. There’s strong evidence that eating fermented soy actually significantly lowers risk of breast cancer in those who have had it or not. And I could SMACK the oncologists who tell their patients to stay away from soy bean oil as the hormonal components are only in the protein, not the oil. Anyway, thanks for the post! Can’t wait to make this tonight! Thank you Savvy Sister! I really appreciate the experiential support and complex knowledge of the issue you offer here on the role of traditional soy foods like tempeh. Hope you enjoy these tasty sticks! Thanks Margie! No, you don’t need to steam it first. Hi Maria, these sound amazing! Romeo has excellent taste, although I disagree with him on sweet potatoes–I will totally line up for those. 😉 I still don’t do much soy myself, but I’ve reintroduced small amounts without trouble, so I’ll probably be including more. I’m thinking tempeh is probably the way to start, so I may make this yet. Otherwise I’ll do the cauliflower option–would be totally tasty in a taco! And while I’m dog-less right now (my sweet pooch Tippy passed away in late 2014, and for whatever reason I’m still getting over it), I’m totally a crazy dog lady too. Lucky Romeo that his person slips him tidbits! HI Lee–So very astute of you to congratulate Romeo on his good taste. 🙂 He will eat sweet potato quite willingly, he just doesn’t line up for it like he does for the tempeh. And yes, when you feel like you’re body is ready to try a little soy, I think tempeh is a great choice. I also like your idea of putting the cauliflower version in a taco! Wow this looks good! I’m pretty sure there is some tempeh in my freezer and I will be trying it soon. Funny how our critters can have such distinct preferences. My cat Woody loved cantaloupe, our cat Pickles loves peanut butter and my daughter’s dog loves chickpeas! I’m always on the lookout for new tempeh marinades, Maria, as it’s a food I make a ton of at home. This one is delicious — I can’t blame Romeo for lining up with a wagging tail! Love the idea of tempeh “sticks,” too — so playful. Great recipe. I also have access to locally sourced tempeh. How many ounces in a package, please? I find that the package sizes are not standard around here. Thanks for this Peggy. I will pass it on to Susan Voisin, who moderates the Fat Free Vegan site, of which my blog is a part. Unfortunately, all I do is write and edit the post and respond to comments, and do not field the kinds of notices you got. I will pass this on to her. Hopefully we can untangle it! Perhaps, though, everything is okay, because I got this comment. Hope you see it too! Hi Maria – I have been remembering these and your story about Romeo and the tempeh sticks. I am making these for Easter … probably served with a baked potato and who knows what else. I am mostly a lurker here but really enjoy your posts and recipes. I had been gluten free for a while and depended too much on corn. Am now learning that too much corn can be depressing – literally. So off corn and your use of millet and just blending flours has taught me a lot. Thanks.